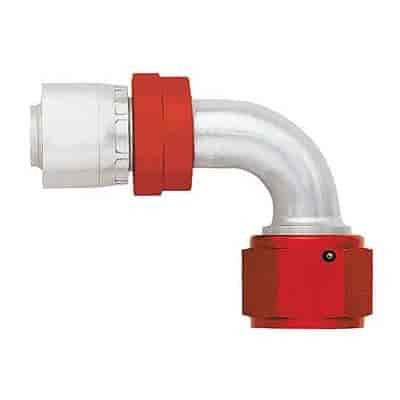 Aeroquip Aluminum Crimp Hose End Fittings are constructed of a one piece design that improves fluid flow and eliminates potential multiple leak points. These fittings are lightweight, suitable for anyone looking to shave off a few extra pounds overall. Crimping the hose end provides a different, improved appearance and great for a more permanent hose placement. Aeroquip delivers a user friendly, easy-to-use fitting that works with AQP stainless steel and StartLite racing hoses. Assembled with Aeroquip's ProCrimp crimp machine. Available in swivel and non-swivel versions. Works with AQP stainless steel racing hoses and StartLite racing hoses.